A media company that more than tripled in size after creating seven jobs has expanded into a Shropshire town’s former courthouse, thanks to a deal completed by Bulleys Bradbury. Nathan Rous PR has moved from its original base in Much Wenlock to Suite 3 on the first floor of The Court, the old magistrates’ building on the outskirts of Wellington town centre. The company was founded in 2008 and moved to Much Wenlock with three workers in 2016 but has now grown to ten staff with clients across Europe and the USA. 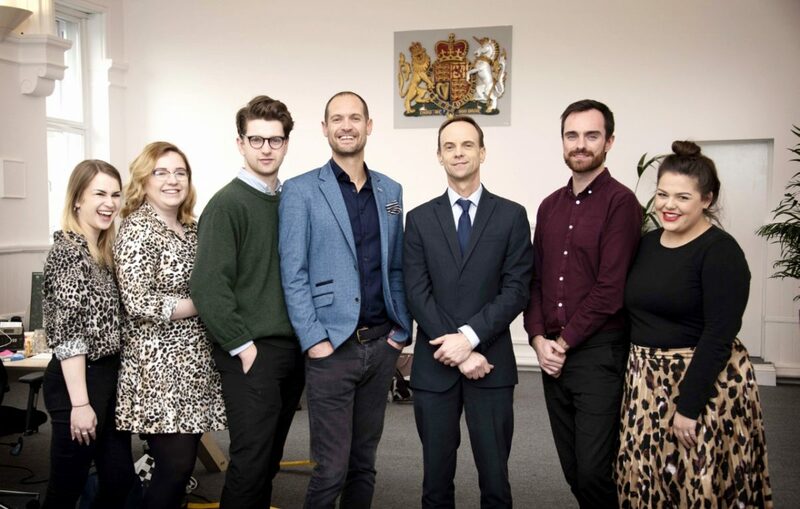 Mr Rous, director of the company, said: “We needed a bigger space but also wanted premises more fitting for our creative agency, and this beautiful room with vaulted ceilings that once served as the actual court room completely fitted the bill. “The room used to contain the magistrates’ bench and still has the original court crest on the wall, and we’ve designed our redecoration of the premises around that central feature. Richard Bradbury, director of Telford-based Bulleys Bradbury, arranged the letting of the 1,107 sq ft office with Nathan Rous PR off an asking rent of £8,856 per annum. Mr Bradbury said: “We’re delighted to have found the right premises to house such a fast-growing company, and we’re sure Nathan Rous PR will continue its success at The Court. “This landmark office building was developed as multi-let offices 18 years ago and is conveniently located on the immediate outskirts of Wellington town centre, with six individual suites and onsite car parking. Any companies interested in space at The Court should call Bulleys Bradbury on 01952 292233 or visit bulleysbradbury.co.uk. One suite of 933 sq ft remains with adjoining rooms on an all-inclusive basis. Bulleys Bradbury was established resulting from a merger of Bulleys Telford Office and Bradbury Commercial Ltd. Bulleys were established in 1965 and have built an enviable reputation as local specialists in the field of industrial and commercial property consultancy. Bradbury Commercial was established in 2007 by Richard Bradbury who has over 25 years’ experience in the local commercial property market. The combined companies benefit from a wealth of experience and ability to deliver, making Bulleys Bradbury one of the leading property consultants in the Shropshire and the wider West Midlands.